Thank you for requesting a Micron R/C Model Rail catalog. These pages have been printed off the Micron web site (www.micronradiocontrol.co.uk) where much more information is available. We are proud to stock a full-range of the DT 2.4GHz DSM2/DSMX receivers many of which are optimised for R/C Model Rail. A brief overview is printed below - please don't hesitate to contact us if you want more information or which to discuss a specific installation. Email is the best contact method as it is not always possible to answer the telephone. If you do call and get the answer service, please leave a message with name and telephone number and we will return your call as soon as possible. Eliminate worry about dirty track, stalls, shorts and all the frustrations of track power. Battery power and radio control – the future of model railways. Radio control (R/C) operation of model railways offers considerable advantages over conventional methods, either direct voltage control or DCC. Like DCC, each R/C model is controlled from within the model itself, so there are no problems running more than one train on a track. But, R/C allows battery operation eliminating any worries about dirty tracks, getting stuck on insulated turnout frogs, etc. R/C trains can operate alongside track powered locos, either direct control or DCC. There is no need to section the track, R/C provides true 'cab control' so you always have full control over your train. Some R/C controllers can handle up to 12 locos, switching 'active' control between each of them. Non-active locos can be configured to either continue at the last setting or stop. Compared to the complexity involved in trying to achieve the same level of operation from conventional wiring, the installation of a R/C battery operated locomotive is relatively simple. The on-board components consist of a radio receiver, usually with built-in speed controller, batteries and motor connected as shown on the right. A switch is needed to isolate the battery when the loco is not in use and some method of connecting to a charger is also required - both can be achieved simply with micro plugs/sockets. A fuse in the battery positive lead is recommended to protect the battery in case of inadvertent shorts while working on the loco. The simplest way of getting started is to choose a receiver with lead-out wires for motor and battery: the red and black wires go to the battery and the yellow or white wires go to the motor. Our range of receivers covers all scales and gauges; from N to SM32, Gauge 1 and beyond with motor currents from 0.5A to 6A. If your motor needs more than 6A, a receiver and separate speed controller can be used. Although most ready-to-run locos have 12V motors to suit powered rail layouts, many trains do not need this voltage. Slow speed operation (e.g narrow guage and shunting) works well with 6V or less; even main-line locos rarely use more than 9V. These voltages are easily provided from single (3.7V) or double cell (7.4V) Lithium Polymer batteries. Multiple cell LiPo batteries require a balancing charger and multi-wire charge lead (e.g. 4 wires for a 3 cell battery). 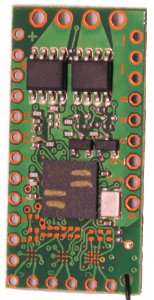 A simpler solution for > 4V, easier to install and charge, is to use a single cell LiPo with a voltage booster module. Rx41d, Rx45 Tiny receivers for N gauge, 009, small OO/HO locos. Max 6V and 0.5A motor current. Rx63 Smallest 'high' voltage receiver, up to 9V and 0.5A (1A at 5V), suitable for OO/HO, 0n30. Rx60, Rx61 13V receivers, up to 1.3A motor current, slightly larger than Rx63. The receivers have short wire aerials. Some are also available with an extended aerial for use in totally enclosed metal bodied locos. All receivers have multiple auxiliary outputs for controlling lights, coupling actuators, sound modules or whatever on-board function your imagination wants to implement. All DT receivers contain extensive programmable features so that you can implement exactly the model control you need. Each receiver is available with several 'variants' which provide a selection of the programmable features appropriate for a typical use. For example: the '-2' variant is for model rail use with a single loco controller such as the Tx20 or Tx21 and the '-22' variant is for use with a multi-loco controller such as the Tx22. When installing a minature receiver in your model, you must ensure that no force or stress is applied to the circuit board. Miniaturisation requires thin materials which must naturally be handled gently. Most of the receivers are supplied as bare boards and care must be taken to avoid shorting the circuit board tracks. A heat shrink sleeve cover will provde protection and this is available as a no-cost option on many of the receivers we stock. Also, the motor output must not be shorted. All receivers have several auxiliary outputs in addition to the motor controller. These can be used for controlling lights, sound cards, smoke generators, couplers, etc. Use of these outputs is highly variable as it depends on what additional behaviour you want to build into your model. Please contact Micron if you want to discuss the options. This is a FET switch with an open-drain which allows it to control high voltage (> 3.3V) external circuits with up to 2A current. When the switch is off, the output pad floats (not connected to either negative or positive); when on, the output is connected to negative. If a receiver has no F outputs (or not enough) but you need to switch a load current greater then 20mA (or 8mA for Rx4x receivers), an external FET switch can be used to convert a P to a F.
We have a range of compatible hand-held controllers from simple, single loco to multi-train units. All are pocket sized and available with forward / reverse on one knob or full-range throttle and separate direction control. 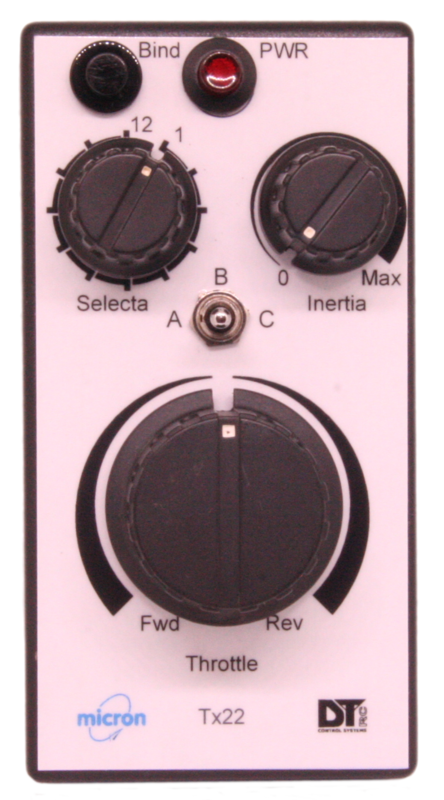 We can also build bespoke controllers with knobs, switches, push buttons to match your needs. The receiver in the loco can only be controlled by a compatible transmitter - the controller. Many transmitters can be used simultaneously without frequency control or crystals. For this to work, every receiver needs to be paired with one transmitter in a process called binding. During binding, the transmitter's unique ID (GUID) is given to the receiver. The receiver then only obeys that transmitter. A receiver needs binding only once. When the receiver is switched on, it searches for its bound transmitter - which is why the transmitter should be switched on first. The transmitter can share its GUID with any number of receivers. One transmitter can control any number of locomotives, but they all receive the same signals so you normally only have one loco switched on at a time. Some of the DelTang controllers have the 'Selecta' feature which is used to select a loco to control. When used with a Selecta enabled receiver (variant -22), the position of the Selecta switch is stored by the receiver during bind. This allows up to 12 locos to be switched on at the same time and the Selecta switch controls which loco is currently active. The Selecta feature is supported in most receivers, but must be enabled before use. The Deltang controllers and receivers operate on 2.4GHz using the popular Spektrum DSM2 protocol. This means that they are compatible with a wide range of other R/C equipment. 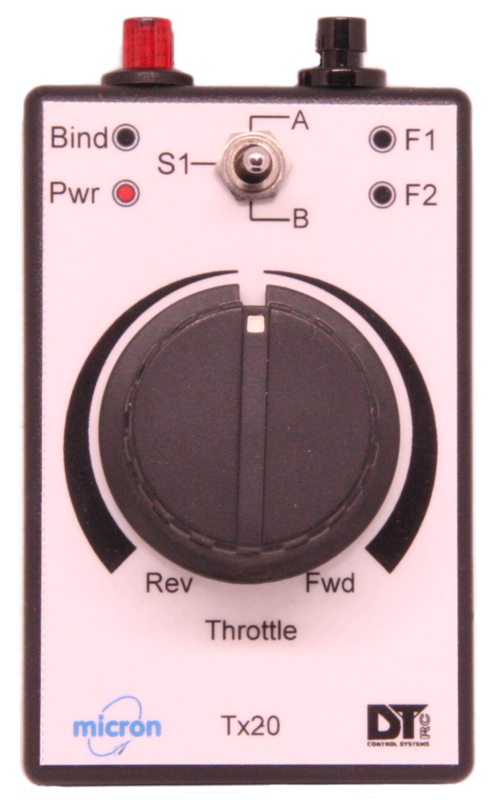 Tx20 A simple, single loco controller with large knob for throttle control, a centre-sprung 3-way switch that can be used for direction control or for lighting, sound, etc. and 2 push buttons that can be used to actuate any of the receiver auxiliary outputs. Tx22 A controller for up to 12 locos using the 'Selecta' system. Receivers respond to commands to enable and disable control - a 'disabled' receiver can be configured to stop the motor or continue at the current setting. The Rx6 and Rx47 receivers can also be configured to allow transfer of control across hand-sets - a sort of 'cab control'. The Tx21 and Tx22 provide an 'inertia' control which sets the loco acceleration and deceleration behaviour. Inertia is implemented in the transmitter to ensure compatibility with all model rail receivers (including non-DT receivers). Rx6x receivers also have a built-in inertia function which may be enabled by programming the receiver. On-board batteries can be NiMH, LiIon or LiPo. LiPo and LiPo provide the best size/capacity ratio and ease of installation. All batteries need careful handling, shorting any type will result in lots of heat and you MUST use a resettable fuse in the positive lead as close as possible to the battery - definitely before the on/off switch and charge socket. This is to protect your model in the event of a wiring fault. Batteries can be charged in the model and LiIon/LiPo can be frequently topped up when the loco is resting. NiMH is best run until discharged and then fully charged to avoid voltage depletion (aka 'memory effect'). Most locos do not need the full 12V - 4V or 8V from 1 or 2 LiPo cells is usually sufficient. LiPo cells come in a wide range of shapes and sizes making it easy to fit into your loco, tender or wagon. Receiver installation can be easy – disconnect the wheel pickups from the motor, locate the battery, receiver and on/off switch and attach the motor wires. You can either wire all components together permanently or use connectors to allow easy separation of the body from the chassis. Miniature 1.27mm pitch polarised and non-polarised connectors are good for the smaller scales (N, OO, 009) and Molex 2mm pitch connectors are appropriate for O Gauge, SMT32, Gauge 1, etc. More complex installations add lighting, sound, smoke control, couplers, ... The Deltang range of receivers is capable of handling it all. We can provide an installation service if you don't feel up to doing it yourself. Contact us for details. After motor control, lights become a common requirement for which LEDs are usually used. High brightness LEDs are recommended because they can be run at low currents (eg: 3mA). LEDs need current limiting resistors to stay within the maximum for the receiver 'P' output (8mA for Rx4x and 20mA for Rx6x) - 220-470 ohms are appropriate values. LEDs which need more current can be connected to receiver 'F' outputs which can supply up to 2A. One or more of the receiver 'P' outputs can be used to control a sound module - e.g. to start/stop the engine or to sound a horn/whistle. Micron currently stocks the MyLocoSound and Mtroniks digiSound modules. Although the Mtronics module is designed primarily for model boats, the simulated diesel engine is suitable for many narrow gauge rail locomotives.